French Emblems: Emblem: Imparilitas. Dissemblance. Sic scit humi tantum serpere Bacchylides. 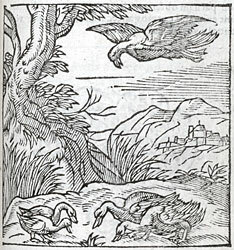 As the falcon cleaves the thin air flying high, as the jackdaw, the goose, the duck feed on the ground, so mighty Pindar soars above the highest heaven, so Bacchylides knows only how to creep along the ground. non parvam observari in ingeniis inaequalitatem. tent: alii verò humi repunt. La Cane, le Geay, l’Oye allent tout contre bas. Mais Bacchylide marche à son beau petit pas. CEcy est prins du second des Olympies. marchent fort bas, & ne sont de grand’ mise. 2. The first two lines are based on Pindar, Nemean Odes, 3.139-144, where Pindar seems to be obliquely disparaging the style and content of Bacchylides, another poet resident, like himself, at the court of Hiero of Syracuse in the early fifth century BC. See Erasmus, Adagia, 820 (Aquila in nubibus); 1988 (Humi serpere).